The SCA has been approached for endorsements of various types over the years. This is the starting draft of an endorsement policy/process. This documents endorsement requests/approvals for future reference and ensures the information is available to future executives, members or other groups. If you encounter any issues downloading the application please do not hesitate to contact us directly at Info@StinsonCommunity.ca or at our monthly meetings. Please review the information below as the starting point. To actively engage community partners in building relationships in order to enrich the community and the neighbourhood. Application Process: Organizations, community stakeholders or SCA members may seek formal SCA endorsement by submitting a completed SCA Endorsement Request form to the SCA Executive. Attachments of information relating to the endorsement request are encouraged. Application Executive Review: Applications will be reviewed by the executive based on Stinson Neighbourhood Action Plan, SCA Values, Vision and Mission. The SCA Executive will present their recommendation to the SCA membership at the next regular scheduled meeting. Applications rejected by the SCA executive will be presented to the SCA membership at the next regular scheduled meeting; however, the application will not be distributed to the membership by agenda. At the presentation of the rejected application, the membership may make a motion to object using the SCA decision-making process. A successful motion to object will result in the application being distributed to the SCA membership at the next meeting. Application distribution: Application information distributed with SCA agenda for next general membership meeting held the 2nd Thursday of each month – check www.stinsoncommunity.ca for the SCA calendar. Private information will not be distributed without authorization. Application Presentation: Application is presented on its own merit at the SCA general membership meeting. SCA executive declare any conflicts of interest (financial or employment). Declaration of conflict of interests are for full transparency and to allow wholesome discussion and debate at the following meeting. A motion to waive the rules may be called and the SCA may proceed to discussion and debate. Applicant Presentation: Applicant, speakers, or interested parties are given the opportunity to present to their endorsement request to the SCA membership (5 minutes). Presenters or speakers should expect a question and answer period (up to 10 minutes). A presentation is not required. Following the presentation, the SCA membership will engage in discussion and debate in absence of the applicant or speakers (This discussion and debate may be held at a future meeting). A motion for further engagement may occur: SCA engages in decision-making process to decide on further engagement with the community. Application Response: All applications will be responded to by the executive in a timely manner following any step that brings a decision to the application being endorsed or not endorsed. Withdrawal of endorsement: Withdrawal of an endorsement follows the same process as above. 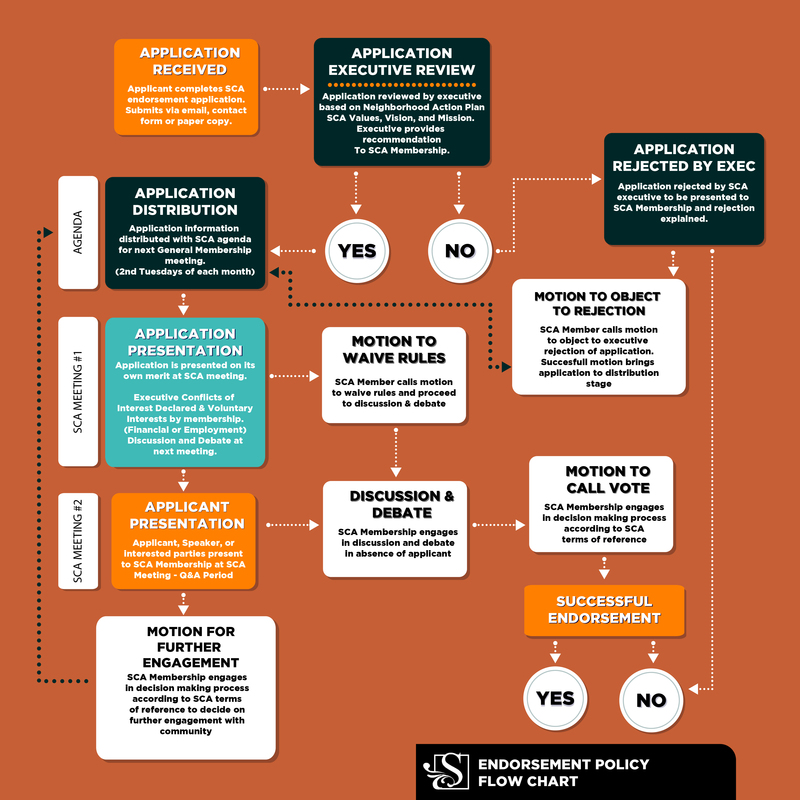 Organizations, community stakeholders or SCA members may seek to formally withdraw a previous SCA endorsement by submitting a completed SCA Endorsement Request application checking off the de-endorse box form to the SCA Executive.